When I hear the word “showdown,” I tend to think of two bad hombres with their hands twitching just over their holstered six-shooters in the streets of Laredo. Fortunately, that sort of thing happens very rarely in your better casino poker rooms these days. If that’s where you are when you hear “showdown,” there’s no need to take cover, as you might have done in the Old West — it’s just a reference to two or more players who are in a poker hand all the way to the end, at which time a winner must be determined. At first it may seem ludicrous that there are rules and procedures to such a simple process. Can’t everybody just turn their cards face up and be done with it? Well, yes, they could — but they don’t. Unfortunately, a substantial percentage of poker players possess a pathological aversion to showing their hands unnecessarily. They’d sooner reveal the nation’s nuclear launch codes than their down cards. You can only get these stubborn players to show by making bamboo shoots grow under their fingernails. There are two different procedures, depending on whether or not there was betting on the last street. If there was no betting on the last street, the procedure is blessedly simple. The showdown goes in the same order as all other actions, starting left of the button and proceeding clockwise to the button. The first player still holding live cards turns them face up. 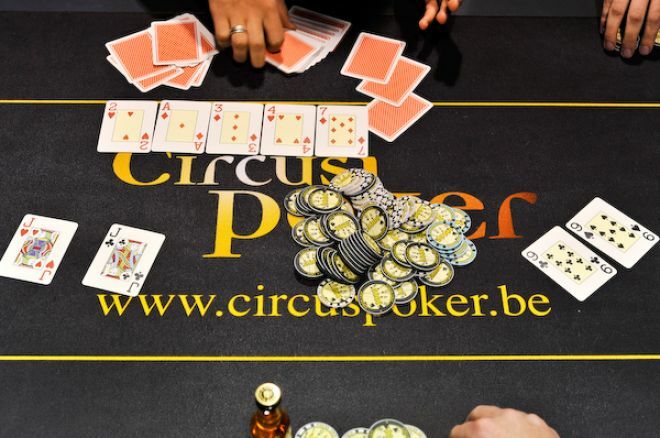 Then each subsequent player can, in turn, put his own cards face up, or, if he sees that he is not the winner, just pass them back to the dealer face down. However, if there was betting on the last street, this all changes. In that situation, the last player to take an aggressive action — defined as either betting or raising — is obligated to reveal his cards first. Then the showdown proceeds around the table clockwise from his position, without regard to where the button is. As in the previous paragraph, each player in turn can choose to show his cards or just muck them. That’s the basics, right there. However, I think it’s worth knowing some additional nuances and etiquette. As I said earlier, there are some players who just won’t go along with the program. They like to gain an edge by playing a waiting game. If they delay long enough, they figure, everybody else will get nervous or impatient and show first. Then they can keep their cards secret unless they see that they have the winner. This especially happens when a player has had a bluff called. He’s embarrassed to show it, but also doesn’t want to just throw his hand away, in case it turns out that he was bluffing with the best hand. (It does happen.) So he just sits there, hoping that you or one of the other players will take the pressure off of him by showing first. This is terribly rude, as it unnecessarily slows down the game, and makes a tactical advantage out of being willing to be a jerk. Never be one of those guys, and don’t let them intimidate you into letting them skip their proper turn to show. The dealer should enforce the standard procedure, but in reality, many dealers care more about getting the hand finished quickly than niceties of procedure. You can, and should, politely ask the dealer to require the players to either show or muck when it’s their turn. Don’t let the bullies take advantage. There is no prohibition on showing before it’s officially your turn. In fact, it’s usually best for everybody if all the players still holding live hands when it’s time for the showdown just flip them face up immediately — no fuss, no muss. The procedures described above were developed to resolve that potential standoff when nobody volunteers to show first. If you have the stone-cold nuts, or a very strong hand, and yet you make everybody else show first just because that’s what the procedure dictates, you may well come under criticism for “slow rolling.” That is a social faux pas, even when you’re just doing what the rules require. It’s considered polite to show your cards quickly — even if it’s not yet your turn — when you’re holding a hand that you have good reason to believe will be the winner. You can hope that other players will show you the same courtesy when they have the monster. Sometimes there will be a side pot. This happens when one player is all in, but two or more others have more chips and keep betting and raising. The all-in player is eligible to win from each other player only the amount that he put into the pot, so when others keep putting in more chips beyond that, they get kept physically separate — a “side pot,” because it’s literally off to one side of the table. When that has happened, the dealer will always request to first see the hands that are eligible for the side pot. The reason is to get that pot awarded to whoever has won it before turning to the main pot. If it isn’t done in that order, and the all-in player has the best hand, it’s too easy for the dealer to make a mistake and push all the chips to the all-in player, including those that aren’t rightfully his. If you always elect to turn your cards face up at showdown, even if you’re sure you hand is a loser, you may give away a little information that you didn’t have to, but you’ll never risk losing a pot because you misread either your own hand or that of an opponent. This is especially true with two-pair hands, which tend to be really tricky and throw people off. Keep these pointers in mind, cowboy. And leave the six-shooters at home. Robert Woolley lives in Asheville, NC. He spent several years in Las Vegas and chronicled his life in poker on the “Poker Grump” blog. You Could Be Cheating, and Not Even Know It!